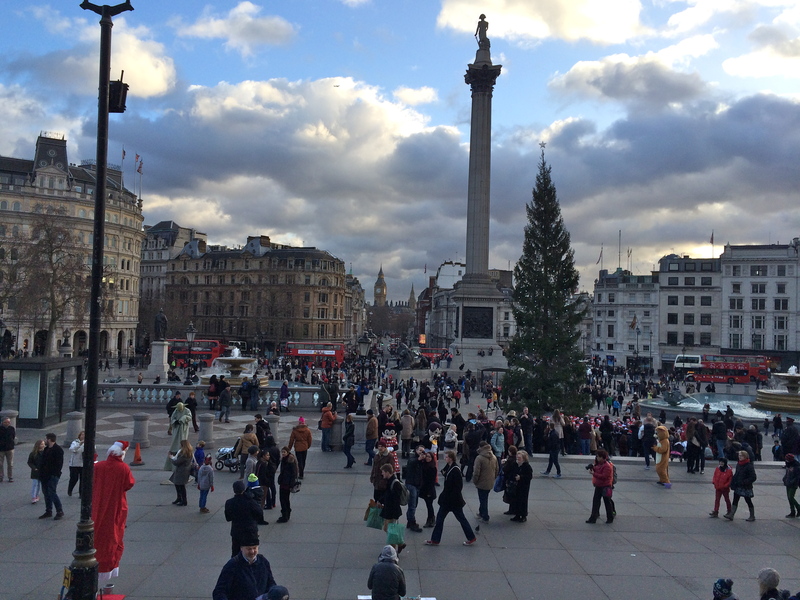 Trafalgar Square from the steps of the National Gallery yesterday afternoon. popped in for an hour or so before doing a bit of Christmas shopping – wanted to check the Turners and Constables. Inevitably stopped by Caravaggio, Van Dyck, Cezanne, Monnet, Sisley, van Gogh…. how privileged we are in London to be able to do this – for free! This entry was posted in Photos - lovelondonscenes and tagged London, Photography, photos, Trafalgar Square. Bookmark the permalink. I see Yoda and the boy! Neat shot! Just love the scene, with people in the foreground, Nelson’s Column magnificent in the the centre ground and Big Ben lurking in the background. Deliberately made the latter centre of the photo. All the rest random! I believe this is a great piece of street art photography!